Some days it can feel like it has been a lifetime since my Dad died suddenly, other days it could have been yesterday. Grief is a funny thing. My children have experienced close relatives dying – perhaps more than I thought they might when they were young. B & A were little when Dad died, and almost straight afterwards my Grandad – Dad’s Dad – also died. Before that we had also experienced the loss of other loved members of our extended family. There is no instruction manual for grief. It is a complex bundle of emotions; sadness, emptiness, anger, confusion, numbness, fear, love, acceptance, hope, thankfulness… and of course family don’t experience these emotions in sync with each other, there is no ‘order’ to feel them in. It can hit in waves, it can leave you feeling guilty on days which feel ‘normal’. It is difficult to navigate for yourself, and difficult to walk alongside others. As a Mum all I could do was walk gently with determination, loving my husband and children as we each waded through different reactions and emotions. Praying for wisdom and strength to face it together, and to share our hope in Jesus with B & A.
I am certain it was important that we were open with our children about their Curly Grandad (he was the Grandad with curly hair of course), ready to talk about what we all missed without him there. I think it is also important to be open to sharing how we have felt at different times or at different occasions – not always the easiest for super-introvert-me. But I am convinced that talking together openly has been important in walking through this together. ..’children can empathise with and show compassion for peers that have been bereaved. Children aged between five and ten often copy the coping mechanisms that they observe in bereaved adults and they may try to disguise their emotions in an attempt to protect the bereaved adult. The bereaved child can sometimes feel that they need permission to show their emotions and talk about their feelings. There were also a multitude of questions that my children had – and perhaps still do. Being as young as he was, A found it difficult to understand the finality of death and for a number of days was looking for Curly Grandad and asking where he was. Strangely T, even though she was born a number of years after Dad died, has gone through very similar stages with us and has also brought her questions about death and how it works. It’s not at all easy to answer questions that need factual detail when you yourself are struggling to come to terms with your loved one’s death. How I wish I could have found a reference book that had all the answers printed out for me at that time. How I wish we could have thought to talk about these topics at a time when we weren’t reeling! It was out of the experience of the first few weeks after Dad died that I began to write. As a Mum of my two very curious, needing detail children, I was looking for the right words, the right way to explain and open up the Bible with them. It was important to find ways to share our faith, our hope because of Jesus about life and death with them. 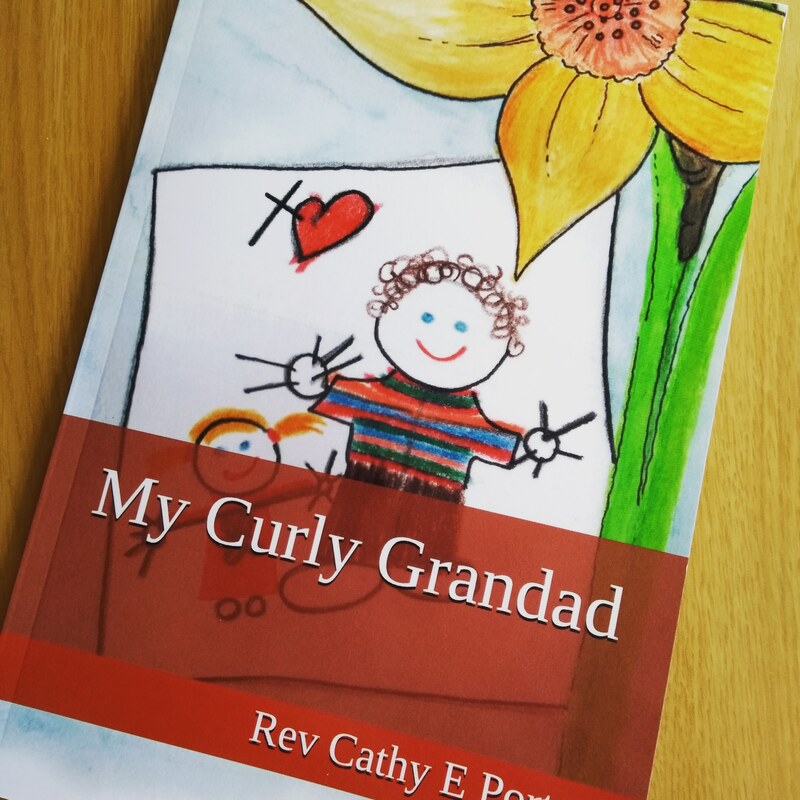 So ‘My Curly Grandad’ was written, partly for them, partly an expression of my own grief and partly for Mums like me needing help finding words and a way in. In writing down their experiences and questions, and weaving Jesus’ good news throughout the story I pray that it spoke to them where they were. I pray now, as it is finally published, that it will speak into other family’s lives and hearts as they walk together in faith, love and grief. How very quickly the seasons of faith come around again. Pancakes have been eaten, and today the season of lent begins. What does lent look like in your family life? If like me you are still wondering if it might be possible to find the energy to be intentional about remembering lent – and want some ideas to explore, here are some for 2019! Julie over at Happy Home Fairy has prepared a countdown to Easter, 40 days with Jesus’ words. A colourful, ready to use however it fits into family life for you, free printable. I can imagine cutting these out and slipping into lunch boxes, or hiding as a treasure hunt each day. They could be displayed once read, hung from some branches brought in from the garden, or pinned up on the fridge and ticked off day by day. For something completely different, how about a lenten movie night. Great list of movie ideas and activity printables at 1 Cor 13 parenting. Baking prayer pretzels together, info from Mina at Flame Creative Children’s Ministry. I have adapted a lent-in-a-bag idea I found here at Build Faith, making the written material a little simpler and clearer. Download my version here. I love the idea of a Jesus tree (like a Jesse tree, but rather than looking at the echoes of Jesus in the lead up to his birth, a Jesus tree focuses on the life of Jesus). There is a lovely free printable by Jennifer at Little House Studio with lots of ideas that could be used but don’t have to be – and some colour in ornaments with devotions. T’s Godmother has sent her ‘Through Lent with Jesus’ by Katie Thompson which is full of daily activities, puzzles and readings. I’ll look forward to looking at that with her. If you’ve been following for a while you may remember a couple of years ago I put together a set of free printable weekly activities tied in with my book ‘My Easter Egg Hunt’ which explores why Good Friday can be good. I’ll be posting these again over on my publishing website. You can also find more ideas for lent on my previous posts about lent ideas.